If you are interested in a complete review of the the bicycle touring gear I took with me, have a look at this bicycle touring gear list. Below is a summary of its weight. Having not really cycled on a fully loaded touring bicycle since Argentina, I was quite interested in seeing how much everything might weigh. Add in another 86kgs for my own body weight (solid muscle, honestly! ), and its quite some significant weight to be pedalling around. With that in mind, plus the fact I am getting on a bit, I decided to take it easy for the first day or so! Most of the people that live in Northampton don't realise or appreciate just how many cycleways the town has. It's always better to use these and keep away from the main flow of traffic, even if it means adding a few kms onto the journey. I managed to get through the centre of town, and out past Billing Aquadrome on cycleways alone. At that point it was time to join the roads. to navigate from. I will be writing more about this GPS in the future. Basically, I started off hating it, but have actually come around to liking it. Anyway, trying to keep my speed deliberately down, the GPS guided me through quiet villages, all of which seemed to boast amazing looking churches. No matter what your religious persuasion or lack thereof, you can't help but appreciate the architecture. The camp-site that I was heading for was just to the south of Grafham Waters, and I arrived mid afternoon pretty satisfied with the days ride. This meant that I wasn't a total wreck, and must still be in reasonable shape! and it takes less than five minutes to put up. I will do a more in-depth review at some point, but briefly, it is a two man tent (allegedly), which is just about big enough for me and my gear. Showers at the camp-site were nice and warm, and I had myself a good feed of curry and rice for dinner. 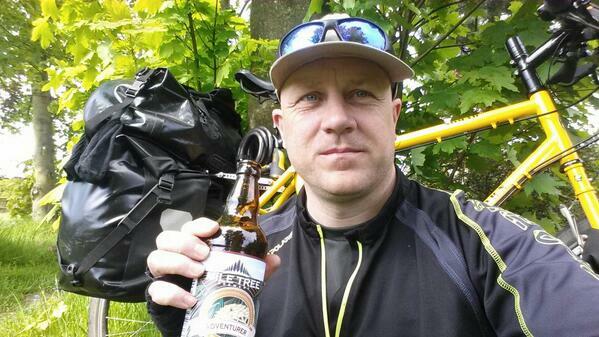 Should have thought to have brought a bottle a beer along in the panniers though! Whenever I travel abroad, I occasionally meet people from other countries who have the idea that England is quaint, with its thatched roof houses and green, peaceful countryside. I like to quickly shatter these impressions of England, as I describe gritty council estates, roads filled with cars not really going anywhere, and town centres devoid of all businesses apart from charity shops and bookmakers. The thing is though, today I rode through quaint England, and very nice it was too! 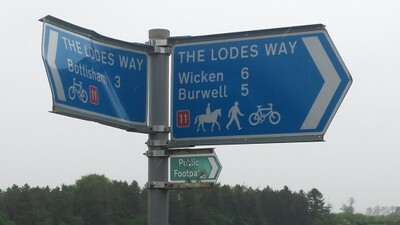 The route I took today followed for the most part Sustrans route 51. This wasn't through any conscious decision of my own, it was just what a combination of my GPS and Google maps came it with. The great thing about this route, is that it used all minor roads and specific cycleways, keeping me a way from heavy traffic. 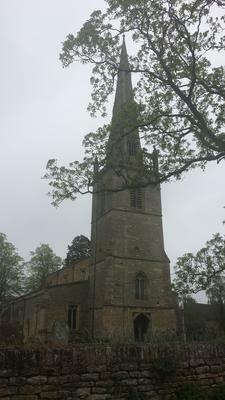 Down quiet country lanes, yes, complete with those houses with thatched roofs, along narrow service roads, and through small villages I cycled. It really was a lovely day to be out on the bike, and warm sunny weather helped as well! 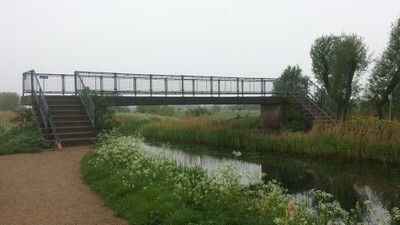 Part of the way from Huntingdon to Cambridge I cycled along the busway cycleway. If only more towns in England could be connected together that way! 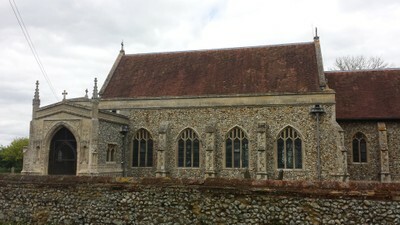 I had decided against spending any time in Cambridge, and so carried on towards Wicken, cycling the Lodes Way to get there. Note for other bicycle tourers… There is a rather inconvenient footbridge to get over which is a bit of a pain with a fully loaded bike! 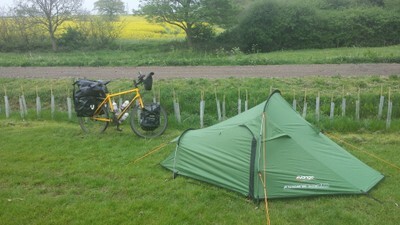 Once in Wicken, I found the campsite and set up, the plan being to stay there two nights, so I could have a look at Wicken Fen without time constraints. Felt hungry so wandered down to the only pub (thatched roof) and had a meal. There are no shops at all in the village, so you can imagine how cheap the meal wasn't! 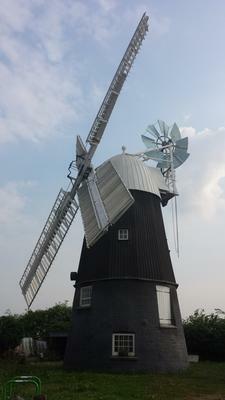 Wicken has got a windmill though. Quaint! day, which gave me a good opportunity to test out my rain-gear. As there probably isn't much of interest to the reader here to share (unless you enjoy reading about me chillaxing! ), I have put a video below. This is a 5 minute film that covers my entire week long trip of cycling the Fens region of East Anglia. Time to leave Wicken and hit the road again. I wanted to fit a lot into the day, and so an earlyish start was in order. 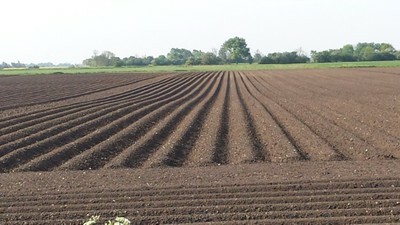 First of all, I cycled northwards to Ely, and then headed for Grimes Graves. Grimes Graves is quite an interesting place, whose main features are hundreds of craters extending across many acres of what is now grasslands. These craters are in fact the remains of filled in Neolithic flintmines, and one of them is open to go down into. (This features in the video above). 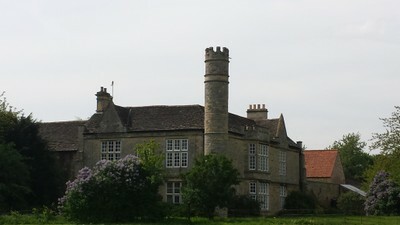 The entire site had quite a special atmosphere, and reminded me in many ways of that of Avebury. It seems the sense of ancient history seems to hang in the air, soaking into the surroundings. Leaving Grimes Graves, I headed to Great Hockham to the camp-site. The staff there were really friendly, and I got chatting to a couple of them about various things. One of the guys is planning a walk from John O'Groats to Lands End. I would cycle it, but never walk it! Dinner consisted of two sausages, chips, fish cake and a spring roll from the mobile fish and chip van. Got to replace those calories somehow! This was always going to be a pretty long day, as I cycled from Great Hockham to Snettisham over on the coast. I had originally planned to cycle the entire length of the Peddars Way, but in the end, decided against it. Instead, I let my GPS pick a route, and I once more found myself on quiet country lanes. Many through the Thetford forest area were unsealed, and it brought back happy memories of of cycling the Pan American Highway in South America. Today, more than any other day, I realised that I still have a burning enthusiasm for bicycle touring. The camp-site was pretty busy on arrival, which was only to be expected on a bank holiday weekend. Found myself a nice cafe, and had a pint with my evening meal though! Although I am starting to rely on the GPS more and more, I really didn't want to backtrack through the hills I cycled yesterday in order to get to Kings Lynn. No matter how hard I tried though, it just wouldn't route along a small stretch of main road. Still, I knew where I was going, and the main road only lasted for a few kilometres. Where the GPS really comes into its own however, is when cycling through big towns and cities. It really does pick the best routes through, sticking to cycleways and quieter roads, and getting through Kings Lynn and Wisbech was simple, despite there being a regional running race on through the centre of the latter at the same time! Today I seemed to be constantly cycling into a headwind. On paper, flat, open countryside would be the best to cycle through. In practice, if you are only cycling in one direction and the wind is blowing against you, its not the best at all! 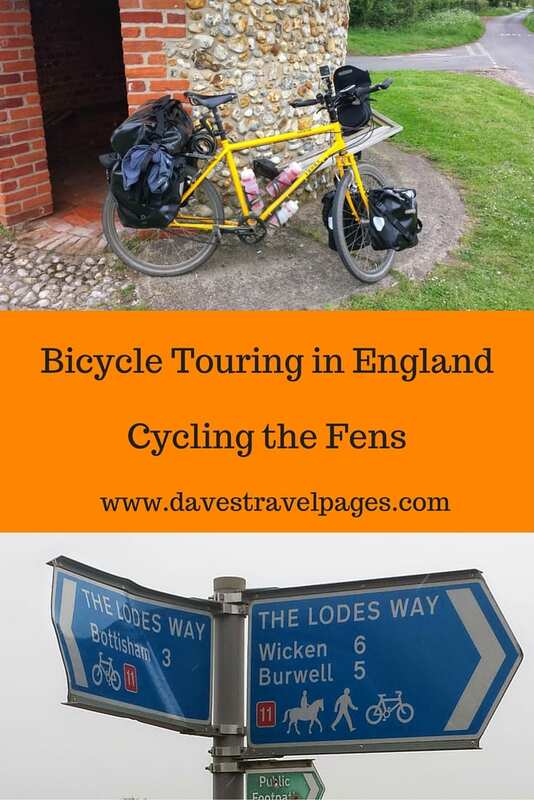 So, if you are planning on cycling through the fens region of East Anglia when bicycle touring through England, you might want to keep that in mind! My camp-site for the night, was a place called the Secret garden, and this wins my “most awesome” award of the tour. Why? Because it had its own micro-brewery onsite, and the excellent Mile Tree Brewery beer only cost £2.50 a bottle! A little carb-loading with the well named Adventurer beer for the next day was in order! This was to be my last day on the road, but involved the longest ride yet. Cycling from Wisbech to Northampton was just over 120kms, which ended up being about 7.5 hours of actual cycling, with 9 hours out on the road. I could have just split the ride in two, and taken an extra day, but I wanted to see if I still “had it” when it came to doing long days with a fully loaded touring bicycle. (I do by the way!). During the journey back, my GPS successfully got me through Peterborough, and it was probably at that point I realised just how good it was. For all its faults (battery life being one of them), the actual routing to get through cities is brilliant. Without it, no doubt I would have just followed road signs and ended up on overly busy roads in heavy traffic. With it, I seem to have avoided all that. 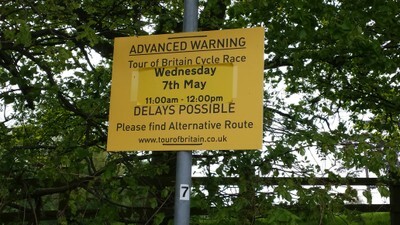 Once near Oundle, I started seeing signs that the Women's Tour of Britain was passing through this area on the 7th of May. I didn't cycle the entire route that they would be taking, but I did do a good portion of it. Of course I was a lot slower! This would be the very first women's Tour of Britain, and the finish of stage 1 would end in Northampton, which I went into town to see a couple of days later. And so, I eventually ended up back home a little tired, but buzzing from the experience. I learned a lot from cycling the Fens region of East Anglia, with the main one being that I still love cycling! Happily, all the gear that I took with me, including the bike, performed brilliantly also. This means that really, I am all set for my next cycling tour around the world. Dave – came across your site in my search for power banks. An upgrade of the gps to the touring means I am now more power hungry. I think you are right to go this route. I did a 4 year trip on the bike and only had about 5 days without power charging. I notice you have not toured Scotland. This is a massive oversight my friend – I live in Scotland of course. Get yourself out to the islands. My conclusion after a lot of touring is that it is as good and demanding ( no shops for days ) as anywhere in the world. Great blog and vids – I know how much energy this takes. Hi, yes I think the power bank wins out over solar, especially for the British Isles! You are right, I haven’t cycled in Scotland yet. I had planned a LEJOG cycling trip at one point, but ended up moving to Greece instead! I would love to tie up a Scottish cycling trip with an Irish one in the future – So many places to cycle, so little time though! Wow, that looks like so much fun. I have done a few hikes in England but traversing the small roads on a bike would be epic. Sounds like fun! I’d like to do some nice (flat) cycle touring in England with my family. Best wishes for your upcoming trip!! I’ve never been one for cycling, but having met with so many amazing cycling travellers over the past few years I don’t know why I don’t start considering it as something to do in the future. Really what I’d like to do is maybe take a month off to cycle somewhere with a friend or two without planning a thing, somewhere away from Europe where I can’t rely upon anything or anyone. This also tempts me to do the same in the UK, somewhere I’m from, but have never seen enough of. A fun little trip, I love East Anglia and also enjoyed reading your blog, but some interesting kit choices! Do you really need all that stuff? It just seems you’re making it so much harder work with all the weight; a smart phone, tablet, GPS, MP3, kindle and camera, a full size foam mat etc? Also 26 inch wheels seems an error, I agree totally that its easier to find tyres for 26 wheels, but I would rather just wait a few days to get some shipped if actually needed. You can now get indestructible 700c wheels and any width of strong tyres, touring with 26 inch wheels for me is tortuously hard work in comparison, but agree still better than taking a trailer 🙂 Anyway interesting to see someone elses kit choices, but personally I like the freedom and hate lugging stuff for the sake of it! Thanks for enjoying the article Ed! I’ve had a few questions about my choice of kit in Facebook groups and other places. So, here we go…. ! Did I need all the stuff? – One of the aims of this one week trip was to test out various bits of gear that I will be taking on my next around the world cycling trip, to see how it performed. It also allowed me to get some notes for gear reviews for the website and YouTube channel (which will go live over the coming weeks and months). So did I need the kindle/tablet/smartphone? No – but what I did need, was to test out the Tecknet Powerbank using a variety of tech gear. However, each of those also had its own uses. The phone let me update my Twitter and Facebook feeds, the tablet i used to write articles and make notes at night, and the MP3 player I used to listen to the radio before going to sleep/ Actually, the only thing I didn’t use in the end was the Kindle. However, weight wise? It weighed no more than two books, be they travel guides, ordinary reading material or notebooks to write down notes with a pen. Just my opinion, but I think a lot of people get caught up over the “too much stuff” issue, without working out how much stuff actually weighs. The GPS – Again, I was testing this out. Its overall weight less than two maps. Not a consideration. 26 inch wheels – It’s a case for each to their own on this one. However, after waiting in Dar Es Salaam for two weeks on new tyres and inner tubes to arrive to fit my 700c because none whatsoever were available in the north of Africa, i would never cycle with 700c wheels again. Its fine in Europe and maybe North America – after that its pointless. For this particular trip, yes if I had a bike with 700c wheels I may have used it, but I just have the one bike! Trailer – Yep, never again! 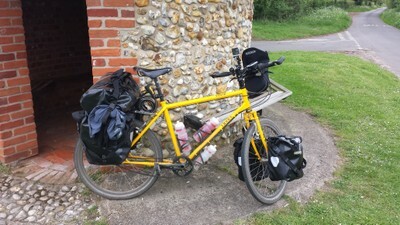 In terms of lugging stuff around – I don’t feel that 22kgs of gear including the weight of the panniers is a terrific amount. Granted, I am a pretty strong rider, but even so, it’s not stupidly heavy. I am estimating that for my around the world trip, I will probably be carrying 30kgs of gear. I know from past experience that this is well within my capability, and that I can still easily cycle between 80 and 100kms a day. I hope this has answered some of yours and others questions, but would love to keep the discussion running. I am actually working on an article about how much weight to carry when bicycle touring, and could include any comments in the article!! I see your point and its certainly a good chance to test lots of different stuff out. I guess we probably just have different ideas I just can’t justify enough kit that I need front panniers but it’s like a friend I have who is cycling to India but taking a complete painting set up with wooden easel sounds like a nightmare to me but that’s what they want from the trip! For me I want cycle touring to feel effortless like just riding my bike on a long ride so I am pretty tight on kit. I agree with the GPS the amount of time it saves you not getting lost in some crappy city is worth its weight in gold have you seen http://www.velomap.org/ this guy makes free open source bike maps for GPS and they are mostly great! I might take a tablet too but only if I get to test a indestructible one! Good luck for your cycle ride to the Himalayas… Be sure to drop me a line when you leave so I am reminded to follow along from the comfort of my armchair!! lol. Good that you got to see the quaint England all the tourists you’ve met were talking about, haha. So are council estates like the ghetto or hood back in the states? It’s hard to make comparisons really. Perhaps Ghetto combined with trailer park might be close, but even then not quite!